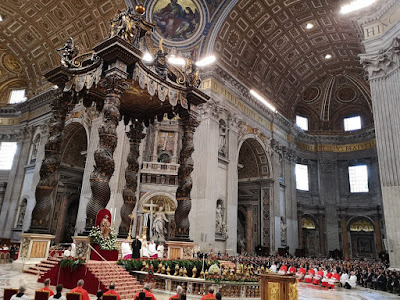 Whispers in the Loggia: "Our Only Credible Authority Is At the Feet of Others" – To Cardinals New and Old, Pope Pits "Church Reform" Against "Palace Intrigues"
"Our Only Credible Authority Is At the Feet of Others" – To Cardinals New and Old, Pope Pits "Church Reform" Against "Palace Intrigues"
At 4pm Rome – 10am Eastern in the States – the Consistory for the creation of 14 new cardinals gets underway in St Peter's. 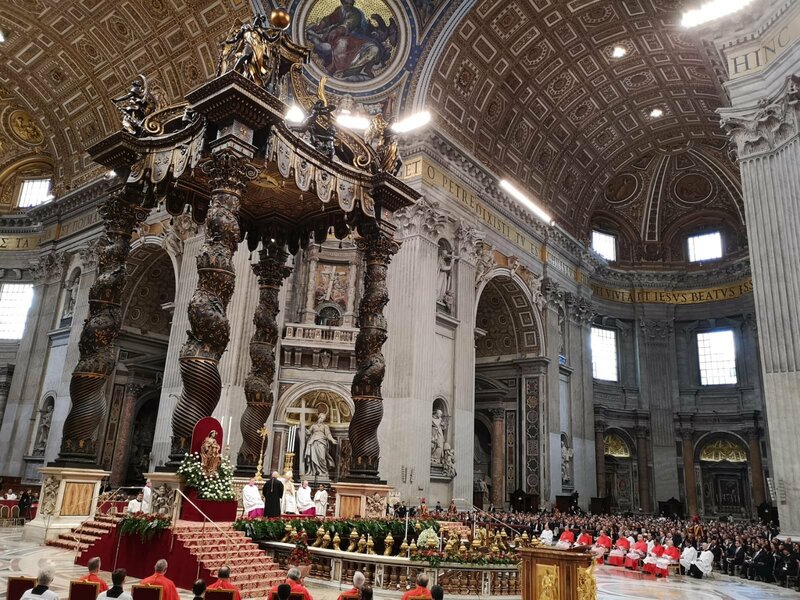 And below, the official English text of Francis' homily – per usual on these occasions, a potent call to service in the face of what he termed "our useless wrangling about who is most important." “They were on the road, going up to Jerusalem, and Jesus was walking ahead of them” (Mk 10:32) . The beginning of this typical passage in Mark always helps us realize how the Lord cares for his people with a pedagogy all his own. Journeying to Jerusalem, Jesus is careful to walk ahead of his disciples. Jerusalem represents the defining and decisive moment of his life. All of us know that at important and crucial times in life, the heart can speak and reveal the intentions and tensions within us. These turning points in life challenge us; they bring out questions and desires not always evident to our human hearts. This is what is presented, with great simplicity and realism, in the Gospel passage we have just heard. At the third and most troubling announcement of the Lord’s passion, the Evangelist does not shrink from disclosing secrets present in the hearts of the disciples: their quest of honours, jealousy, envy, intrigue, accommodation and compromise. This kind of thinking not only wears and eats away at their relationship, but also imprisons them in useless and petty discussions. Yet Jesus is not concerned with this: he walks ahead of them and he keeps going. And he tells them forcefully: “But it shall not be so among you; whoever would be great among you must be your servant” (Mk 10:43). In this way, the Lord tries to refocus the eyes and hearts of his disciples, so that there will be no fruitless and self-referential discussions in the community. What does it profit us to gain the whole world if we are corroded within? What does it profit us to gain the whole world if we are living in a stifling atmosphere of intrigues that dry up our hearts and impede our mission? Here, as someone has observed, we might think of all those palace intrigues that take place, even in curial offices. “But it shall not be so among you”. The Lord’s response is above all an encouragement and a challenge to his disciples to recoup their better part, lest their hearts be spoiled and imprisoned by a worldly mentality blind to what is really important. “But it shall not be so among you”. The voice of the Lord saves the community from undue introspection and directs its vision, resources, aspirations and heart to the only thing that counts: the mission. Jesus teaches us that conversion, change of heart and Church reform is and ever shall be in a missionary key, which demands an end to looking out for and protecting our own interests, in order to look out for and protect those of the Father. Conversion from our sins and from selfishness will never be an end in itself, but is always a means of growing in fidelity and willingness to embrace the mission. At the moment of truth, especially when we see the distress of our brothers and sisters, we will be completely prepared to accompany and embrace them, one and all. In this way, we avoid becoming effective “roadblocks”, whether because of our short-sightedness or our useless wrangling about who is most important. When we forget the mission, when we lose sight of the real faces of our brothers and sisters, our life gets locked up in the pursuit of our own interests and securities. Resentment then begins to grow, together with sadness and revulsion. Gradually we have less and less room for others, for the Church community, for the poor, for hearing the Lord’s voice. Joy fades and the heart withers (cf. Evangelii Gaudium, 2). “But it shall not be so among you”. Jesus goes on to say. “Whoever would be first among you must be slave of all” (Mk 10:43.44). This is the Beatitude and the Magnificat that we are called to sing daily. It is the Lord’s invitation not to forget that the Church’s authority grows with this ability to defend the dignity of others, to anoint them and to heal their wounds and their frequently dashed hopes. It means remembering that we are here because we have been asked “to preach good news to the poor...to proclaim release to the captives and recovering of sight to the blind, to set at liberty those who are oppressed, to proclaim the acceptable year of the Lord” (Lk 4:18-19). Dear brother Cardinals and new Cardinals! In our journey towards Jerusalem, the Lord walks ahead of us, to keep reminding us that the only credible form of authority is born of sitting at the feet of others in order to serve Christ. It is the authority that comes from never forgetting that Jesus, before bowing his head on the cross, did not hesitate to bow down and wash the feet of the disciples. This is the highest honour that we can receive, the greatest promotion that can be awarded us: to serve Christ in God’s faithful people. In those who are hungry, neglected, imprisoned, sick, suffering, addicted to drugs, cast aside. In real people, each with his or her own life story and experiences, hopes and disappointments, hurts and wounds. Only in this way, can the authority of the Shepherd have the flavour of Gospel and not appear as “a noisy gong or a clanging symbol” (1 Cor 13:1). None of us must feel “superior” to anyone. None of us should look down at others from above. The only time we can look at a person in this way is when we are helping them to stand up. I would like now to share with you a part of the spiritual testament of Saint John XXIII. Progressing in his own journey, he could say: “Born poor, but of humble and respectable folk, I am particularly happy to die poor, having distributed, in accordance with the various needs and circumstances of my simple and modest life in the service of the poor and of Holy Church which has nurtured me, whatever came into my hands – and it was very little – during the years of my priesthood and episcopate. Appearances of wealth have frequently disguised thorns of frustrating poverty, which prevented me from giving to others as generously as I would have wished. I thank God for this grace of poverty to which I vowed fidelity in my youth; poverty of spirit, as a priest of the Sacred Heart, and material poverty, which has strengthened me in my resolve never to ask for anything – money, positions or favours – never, either for myself, or for my relations and friends” (29 June 1954). Jesus uses the same verb, proago, when he tells his disciples that he will “precede” them into Galilee (cf. Mk 10:32). Cf. JORGE MARIO BERGOGLIO, Ejercicios Espirituales a los Obispos españoles, 2006. A New Marian Feast... Another "Montini Moment"